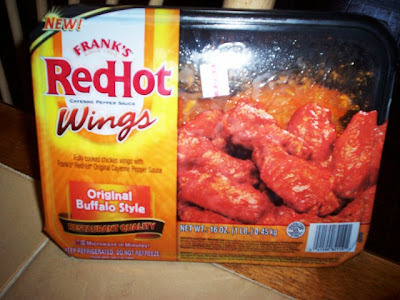 What better way to honor our troops on this day than to eat a big box of microwaved buffalo wings. Mom decided that these wings ($6.99 on Stop & Shop) were the perfect addition to our Memorial Day feast of hot dogs, cole slaw, potato salad, and chocolate cupcakes. We had never purchased this product before, but were pretty confident that it was going to taste great. THE VERDICT: Fleshy. My sister and mother did not have any wings, but both my father and I thought that the wings could have been a little crispier. Mom followed the recommended directions when microwaving, but I think that because the wings were so coated with tasty buffalo sauce, there was no way for them to dry out. Perhaps if we had put them in the oven they wouldn't have been as slimey, but I will say that the wings were very flavorful. I just adore that tangy buffalo sauce.